Ph.D. student Sher Afghan Asad has won a Small Grant in Behavioral Economics from the Russel Sage Foundation. Congratulations to Beatriz and Otavio Bartalotti on the newest member of their family! 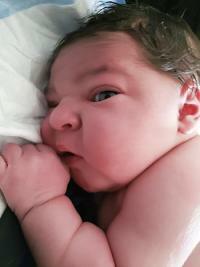 A little girl, Helena Pereira Bartalotti, was born at 5:03 on April 22, 2019. 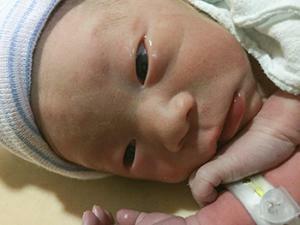 She weighed 4.026g (8 lb 14 oz) and measured 52cm (20.5 inches). Otavio reports that the whole family is doing well. Keri Jacobs, associate professor and Iowa Institute for Cooperatives Endowed Economics Professor, led a training workshop on April 16 on the cooperative business model for ISU faculty who will teach in the Ivy College of Business executive MBA program (Ivy EMBA). Three Post-Docs (2-year appointment) - UN Temporary Professional Officer, P2 level. Dermot Hayes, professor, was quoted in an April 16, 2019, CNBC story, "China eyes U.S. poultry, pork imports in trade talks -sources." Wendong Zhang, assistant professor, made a presentation at the Iowa State University Extension and Outreach Center in Sioux City April 15, 2019, and was covered by KTIV, Sioux City. Alejandro Plastina, assistant professor published a new report, "Egg Processing, Cartoning and Transportation Costs: A Special Report," for the Egg Industry Center. The Winter 2019 CARD Agricultural Policy Review is now available. David Swenson, associate scientist, was interviewed by Grant Gerlock, Iowa Public Radio, about whether the country, and Iowa in particular, is “full” as asserted by the president and the importance of foreign-born workers to the state’s economy. Mark Edelman, professor, made a Community Reinvestment Act presentation to 40 bank compliance officers from across Iowa at a round table sponsored by the three federal regulators April 9, 2019. Dermot Hayes, professor, was quoted in an April 7 The Daily Iowan article about the lack of progress with trade negotiations with China. Chad Hart, associate professor, was interviewed for an April 4 Dispatch-Argus article, "Mexico touches everything we do in Iowa: Economist says Trump's plans could hurt entire economy." Grad student Gyu Kim, his wife Eunmi, and daughter Miso welcomed Lachlan, a beautiful baby boy, to their family at 10:19 am Thursday morning, April 4. Lachlan weighed 4 lbs. 14 oz. and was 18 3/4 inches long. Congratulations! Chad Hart, associate professor, was interviewed for a April 3 Des Moines Register story, "Farm losses drive Iowa's flood damage to $2 billion, Farm Bureau economists estimate." 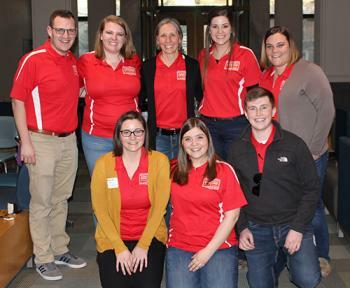 Ag Business Curtiss League members attended the annual Curtiss League Kick-off on Saturday, March 30th at Iowa State. The Curtiss League is the College of Agriculture and Life Sciences’ young alumni program. Members assist the college with recruitment, advocacy and awareness efforts. Mark A. Edelman, Professor and Community Vitality Center Director, presented a speech "Strategies for Entrepreneurial Rural Communities in Times of Uncertainty," to an audience of 175 at the Mitchell County Ag Breakfast on March 21, 2019. Ag bus senior, Connor Bollum, was recently featured on the CALS Study Abroad blog. Dermot Hayes, professor, was quoted in a Southeast AgNET story, "NPPC Calls for Swift U.S./Japan Trade Negotiation" April 1. Wendong Zhang, assistant professor, was interviewed for a March 30 Star Tribune story, "Farmland prices reach historic highs in Upper Midwest." David Swenson, associate scientist, was interviewed for a March 31 Quad-City Times story, "Iowa legislators look to slow property tax growth." Anni Isojaervi, fourth year Ph.D. student, presented her paper "Accounting for the Gender Wage Gap: A Search and Matching Approach" at the Midwest Macroeconomic Meetings in Nashville last November. Keri Jacobs, associate professor, was selected as a University Ambassador for the Land O’Lakes Global Food Challenge this year.